One of my favorite things I learned to make in pastry class was the Opera cake. This classic French dessert was created by Louis Clichy, who called it – quite naturally – the Clichy. 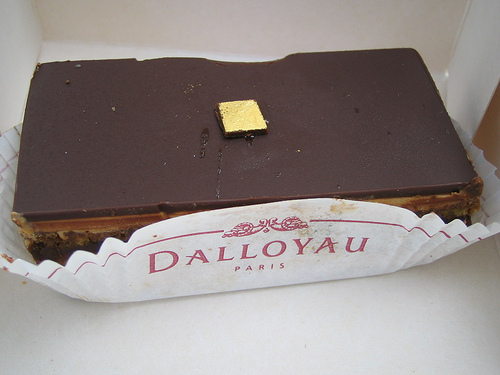 However, it was popularized by the Parisian pâtisserie Dalloyau as the Opera cake and is now mostly known by that name. It is a wonderfully rich and dreamy combination of delicate almond biscuit or joconde, chocolate ganache, coffee buttercream, and chocolate glaze. It’s like a very refined and decadent layer cake. I used a version of the recipe which called for four layers of the joconde, three layers of buttercream, a layer of ganache, and the glaze. While the combination of flavors and textures was just as luscious as I remember,I think I prefer the slimmed-down seven layer version I’ve made before. The balance of buttercream and chocolate seemed to work better. (I’m not the biggest fan of buttercream, but its espresso-laced incarnation in the opera helps make it the out of the world experience it is for me). 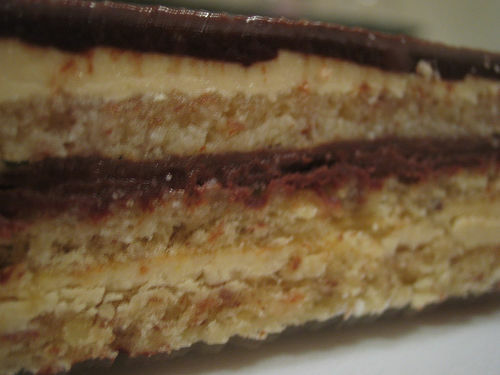 There is a very good recipe for Opera cake in Doris Greenspan’s Paris Sweets – she adapted Dalloyau’s own version of it! I actually had the fortune of trying Dalloyau’s version in Paris last fall. I have to say that even though I was a tourist buying just a 5 euro slice of cake, I was treated with the same friendly, smiling service that all the other customers picking up their orders of foie gras and truffles! Yes, the recipe in the Paris Sweets book is a very good one, especially the joconde and the glaze parts as I remember. It’s a wonderful little book too -it captures Paris so well and is and one of my favorites! I was at the Dalloyau in 2006,anyone going to Paris has to go there. Their work looks and tastes out of this world. I’d love to shadow there and they can have me work for free. I’m featuring your cake in my Birthday Cake roundup to kick off my birthday month! There are many different stories about the origin of the opera cake, and I’m not sure a definitive conclusion has been reached. The Clichy theory is very popular, as well as one that it was created in the kitchens of Dalloyau. I have also seen the Lenotre story as well. Perhaps I should amend to indicate that there are many claims to the inventor of this pastry! Thanks!